Truck wrecks are usually more complex and devastating than types of motor vehicle accidents. Federal and state laws set strict guidelines for the maintenance and operation of semi (18-wheeler) trucks that do not apply to standard passenger vehicles. Unfortunately, despite strict regulations, truck accidents occur far too often and with catastrophic consequences for those involved. If you’ve been hurt by a big rig, the experienced truck accident attorneys at the Law Offices of Gary Bruce can help. Call us today at 706-596-1446 to discuss your case for free. We welcome clients from several communities in Georgia, including Columbus and Fort Benning, as well as individuals in and around the Phenix City, Alabama, area. Driver fatigue: One of the most common causes of truck-involved crashes in the U.S. is truck driver fatigue. Although federal regulations stipulate the amount of off-time and rest truck drivers require, employers and big rig operators often disregard these safety standards to shorten drive times and increase profits. Distracted driving: All operators of motor vehicles are susceptible to the myriad of potential distractions available today. When drivers fiddle with GPS devices, text while driving or engage in other extraneous activities while behind the wheel, they pose serious threats on the road. Reckless driving: Despite strict safety guidelines, the pressure to meet deadlines can affect a truck driver’s judgment. Reckless driving can include excess speeds, unsafe lane changing, tailgating and disregarding traffic signs and signals. Drug use: Typically, when a truck operator is driving under the influence, amphetamines are more likely to be the cause of impairment than alcohol. Truckers will take these substances in an effort to stay awake and alert behind the wheel. However, any drug use puts both truck operators and other drivers at considerable risk. 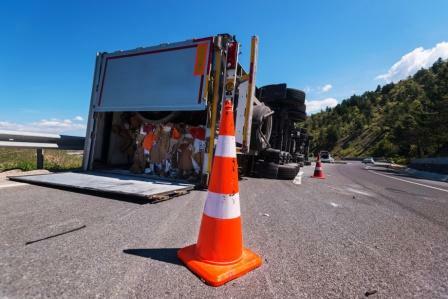 Improperly secured cargo or oversized loads: Improperly secured cargo can affect a truck’s center of gravity by shifting inside and increasing the likelihood of a rollover. Likewise, when a commercial truck’s storage compartments are loaded beyond their recommended capacity, it can disrupt the trailer’s center of gravity and increase the risk of a wreck. Inexperienced or poorly-trained truck drivers: In an effort to cut corners and save time, some trucking companies fail to ensure their drivers are properly trained before sending them out on the road behind the wheel of an 18 wheeler. Poor truck maintenance: Semi trucks can haul nearly 80,000 pounds and are driven thousands of miles every year. These long, heavy hauls take a toll on these trucks, and parts are constantly wearing out and needing to be replaced. When trucking companies, mechanics and drivers fail to perform regular inspections and maintenance, accidents happen. Due to their massive weight and size, 18-wheelers are involved in some of the most devastating accidents on today’s roads. According to data from the National Highway Traffic Safety Administration, semi truck collisions account for a higher rate of severe injuries and death than wrecks that only involve passenger vehicles. Our attorneys know how these injuries can affect your life and well-being. The consequences of severe injuries extend far beyond just the cost of medical bills and rehabilitative expenses. Don’t put your future in the hands of an insurance company. Contact our firm today to discuss the true merits of your case for free. Tragically, some truck accidents result in death. With more than 25 years of experience fighting on behalf of families affected by a wrongful death, Gary Bruce and our team of attorneys understand that no amount of monetary recovery can undo the harm of this tragedy. However, we also know that you shouldn’t bear the weight of someone else’s negligence alone, and compensation can help you cover end-of-life expenses and begin to rebuild your life. Compensation also provides you the opportunity to hold the responsible party accountable, and hopefully help prevent similar negligence in the future. Only specific people are eligible to file a wrongful death claim, primarily the dependents or immediate relatives of the deceased. However, in Alabama, only a personal representative of the deceased's estate can file a wrongful death claim. Like any personal injury claim, there is a statute of limitations that defines the amount of time you have to file a wrongful death lawsuit, so contact us quickly. Our lawyers can determine whether you still have time to file a claim. When truckers or their employers ignore industry regulations, the risk of accidents and injuries increases. Our attorneys possess comprehensive knowledge of the state and federal state guidelines that regulate the trucking industry in both Georgia and Alabama. We are passionate about helping injury victims recover the full and fair compensation they deserve. 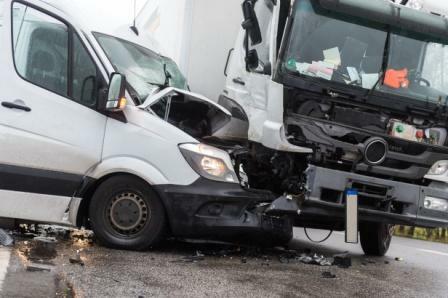 Because these accidents happen all too frequently, our experienced truck accident lawyers are prepared to quickly investigate the true cause of your accident and identify all parties potentially responsible for your injuries. Unlike many motor vehicle accidents, liability in tractor trailer wrecks can involve multiple parties. Not only do trucking operations involve actual drivers of 18 wheelers, they also include mechanics, design engineers and owners. Trucking companies and their insurance companies will do everything they can to protect their own interests, not the well-being of you and your family. They have lawyers, experts and investigators on their side. So do we. Our attorneys are passionate about protecting the rights of our clients, and we won’t back down to these powerful opponents. We know how these companies work and we will not stop pursuing the full and fair compensation you deserve. The legal process can be intimidating, especially in complex cases such as trucking accidents. Let us help reduce the stress of your recovery by ensuring all of your medical costs are covered, from your initial hospital visit to extended care, if necessary. Medical debt is a leading cause of bankruptcy in America, but with the right personal injury lawyer at your side, you have an opportunity to avoid the burden of debt that many unrepresented accident victims must endure. We proudly offer legal services to military families who are facing any type of personal injury case, including trucking accidents. Wrecks that involve service members, whether on base or in other areas of the community, involve a special set of skills and experience. The Law Offices of Gary Bruce has extensive experience with the complexities of military-involved accident claims and can help you effectively navigate the process of your claim. If you’ve been hurt in a truck accident in Georgia or Alabama, contact the Law Offices of Gary Bruce today online or at 706-596-1446. We can discuss your case for free over the phone, in our office, at your home or in your hospital room. We welcome clients from Columbus and Fort Benning, Georgia; Phenix City, Alabama; and the surrounding areas in both states.